The Patchwords Press is published monthly by the Foothill Quilters Guild. The newsletter is free to Guild members in good standing. Previous newsletters are available in the Members Only section. Any quilt guild in California with whom we exchange newsletters may reprint articles without further permission by adding the following credit: "This article by [author] is reprinted from the [appropriate date] issue of the Foothill Quilters Guild Newsletter, Auburn, CA." Previously unpublished manuscripts and information about members are welcomed. 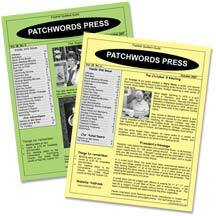 Articles may be emailed to the Patchwords Press editor, Maryann Mealhow. There is a 10% discount for a full year’s advertising, paid in advance. Please make checks payable to the Foothill Quilters Guild. Ads may be emailed (preferable) or sent as camera-ready text/illustration. All articles and ads must be received by the Thursday following the monthly board meeting, which is held on the third Monday of the month.